What your mother never taught you about having cancer. Check out my Athletes4Cancer fundraiser page. Ten months. Long enough to have a baby. Long enough to lose several friends to cancer. Not long enough to figure out if I have a recurrence. Ten months ago I complained to my radiation oncologist about severe pain I've been having in the same quadrant of my body where a team of crack scientists poisoned, cut and burned the cancer in me two years ago. An MRI was ordered, but due to the shortage of MR machines in the province the scan was not until six weeks later. In the interim other odd symptoms started popping up. Last week was my final session with the Sutherland Chan breast massage clinic in Toronto. I highly recommend it to anyone who is finding that they are still stiff from surgery. The name of the clinic is a little misleading, as the focus is on treating the effects of surgery, radiation, etc. in the breast area which have caused pain or reduced range of motion. Patients are assigned to a single student therapist for 8 weeks. All of the students are in their final semester of the program. There are two instructors, Debra and Sasha, who supervise the students. The instructors are closely involved with the initial assessment and treatment plan and also make rounds during the sessions to observe and demonstrate techniques. Sasha is a Vodder trained lymphedema therapist. Debra is one of the owners of the school and has almost 30 years of experience. While the students I had were good, I melted for the 5 minutes each session when either Debra or Sasha would stop by to demonstrate a lymph drainage technique or a way to get into a stubborn adhesion. Because I have lymphedema my sessions were a combination of manual lymph drainage and scar work. Shortly before the program began I was diagnosed with bursitis in my shoulder. During the assessment Debra found that I had extensive adhesions (scar tissue that has attached to other normal tissue) in my axilla, along my side and on my pectoralis major. After three treatments my shoulder was no longer hurting. Over the next weeks more, deeper adhesions were found and loosened. If you can believe it, my left and right sides almost feel the same now. The sessions last one hour, once per week and cost $16. Many private insurance policies cover treatments given at the school. You have to commit to coming in for 8 consecutive weeks. Unfortunately the breast massage clinic is only held in the winter/spring term, so there won't be any more classes until January of next year. However, Sasha is teaching a fourth term scar massage clinic on Tuesday evenings starting May 6. These sessions are in the evening and cost $40 per session. I haven't called yet to find out if it is necessary to commit to several weeks, or if it is on an as-needed basis. I wish I had known about this moisturizer when I was having radiation. It's water-based, unscented, petroleum/mineral oil free, and paraben free. It can be purchased at any of the four Sugarmoon locations in Toronto and St. Catherines. They often have sales on their products. I believe it may be the same product as Alexandria Restore Hydrating Lotion, but don't quote me on that. This moisturizer contains aloe and is designed for use after sugaring or waxing, perfect for irritated, radiated skin. It is thinner than Glaxal Base Cream, so more frequent use would be necessary during treatment. "Has your tumour shrunk at all?" How was I supposed to know? The doctor's were the ones with the fancy measuring tapes. The best I have is a straight edge, not the best tool for measuring a 3 cm tumour. Anyway, this chemo stuff isn't actually supposed to work, is it? Well, guess what. Three weeks after starting chemo, the oncologist measured my tumour and found it had shrunk 0.5 cms in one dimension and 1 cm in another (the 3rd dimension being unmeasurable by hand). That was enough to inspire me to figure out a way that I could easily measure my tumour to monitor how much it was shrinking. Here's my handy method that requires no tools (provided that you can feel your tumour). 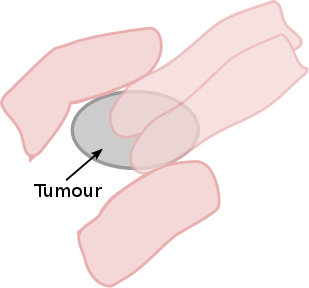 With one hand, place your thumb and forefinger on the outer edges of the tumour. Then with the other hand place as many fingers as will fit between the two fingers of the first hand. Make a note of the number of fingers (and which ones) -- this is your measurement. Just in time for Christmas, here are 10 of my personal strategies to reducing my cost of living in Toronto. *Update 3-Jan-2014*: I forgot to include Toronto On A Shoestring - another wonderful source of cheapskate knowledge! It's been a year since I had my last docetaxel infusion and I still haven't written anything about how I coped with the experience. To be honest, I'm not really sure I did, not well anyway. I know that not everyone reacts badly to docetaxel, but I was not so lucky. That said, I've been making notes of the various things I tried in my attempts to survive with my sanity intact. The one side effect that everyone undergoing radiation therapy will experience is skin irritation and potential breakdown. Most people compare the skin reaction to a sunburn -- how bad of a sunburn will depend on a number of factors. Don't assume that having darker skin will protect you from the effect, you should still care for your skin as if you are the palest person you have ever seen. Travel Medical Insurance is intended for emergency care, not routine or planned care. Do not expect it to help you get care at your favourite US cancer centre. It doesn't work like that. They will shoot that claim down faster then a rabid squirrel. If your doctor tells you not to travel, then don't. If you have symptoms before you travel, don't wait to see a doctor. Being in denial about your situation is not an insurable condition. In general, medical coverage begins on the departure date and cancellation insurance coverage begins on the date of purchase (of the insurance). The pre-existing condition stability period is determined according to the coverage start date for each of these. For the purpose of this review, I am assuming the purchaser is under 65, has provincial health coverage, has or has had cancer, and considers their condition to be stable. This review will help you to determine if your condition is stable enough and has been been stable enough for the required period of time to be covered by the insurer. It is up to you to decide if the policy covers all of your needs (for example, missed cruise ship disembarkation, additional pet boarding expenses, luggage delay or loss, etc.). If you haven't read my previous post on travel insurance, Have Cancer Will Travel, then please do. And now lets begin! Update (2013-03-06): I found a few nasty catches in a few policies that everyone needs to be aware of. Some policies will not cover you if you have ever had a bone marrow transplant. Some travel medical insurance policies will not cover you if you have ever been diagnosed with lung cancer or metastatic cancer. Some travel medical insurance policies will not cover you if you wind up having to have chemo between the date you purchased the policy and your date of departure. I came across one plan that requires you to inform the company if there is a change in a previously stable pre-existing condition before your date of departure. The company will then decide if they wish to continue to honour your insurance policy, whether that be for the travel medical portion of your policy (which makes some sense) or for the trip cancellation portion of your policy (seriously not cool). I will be writing a few reviews of policies in both Canada and the US, in order to give you all a feel for what is out there. For me, travel is an artform. It is my favourite past-time. It's relaxing. It's exciting. It's educational and emotional. Travelling and planning to travel are some of my favourite ways to escape my every day stresses. So imagine the suckage when I realized that having had cancer could interfere with travel insurance coverage. Partway through chemo my office sent me a big basket of chocolate bars. It was well-meaning. However, I had been on a health kick long enough by that point that I had gotten down to my ideal BMI, chocolate was rarely part of my diet, and I was feeling really proud of how well I was taking care of myself (all things considered). Unfortunately chocolate is a bit of an addiction for me and the basket of temptation was too much to resist, particularly since my energy levels were nil. If you are trying to figure out what to get a friend who is going through cancer treatment, have a look at my suggested gift items. Like all things in life, (keeping track of everything for) chemo is much easier when you have an iPhone app to help you. Below are my favourite AppStore apps for keeping yourself organizized through treatment. Sometimes it seems like everything that has happened was meant to be. Or rather, everything good that has occurred happened to prepare me for everything bad that was to come. "OK, Laura, breathe in... And out. Now big breath in and hold." This was the mantra spoken over the microphone six times a day for five weeks. While I lay there as still as possible with my nose pinched tightly by a clamp, holding a one-time-use disposable snorkel between my teeth, I followed the instructions given by the voice to a tee - desperately trying not to swallow in between breathes, as that would cause my ears to pop, leaving me with uncomfortable be-popped ears until the day's treatments were finished. Now that I've gotten past the surgery part of my treatment, here is a list of a few things that I found invaluable. Cancer almost inevitably results in having less moola to get by on. You're working less or not at all, you have hella medications to buy (some costing as much as $3000 a dose), you're constantly shuttling yourself back and forth from the hospital paying for transit or parking. In the absence of a Cancer Discount Card (which I would totally love to set up if there is anyone out there who wants to work on that with me) it helps to grab whatever free or almost free stuff you can. Aside from the well publicized ride services and free wigs (via the Canadian Cancer Society) there are a number of other freebies available to us, some logical, some kind of random. Cottage Dreams provides one week at a cottage in Ontario to anyone who is currently not in active treatment. I imagine that taking Tamoxifen or getting your year of Herceptin infusions doesn't count, but I guess it's worth asking. If you are in treatment you can apply now for when you have finished treatment. There is a $100 registration fee and a $175 refundable deposit. It gets cold without any body hair. Victoria's Quilts will send a free quilt to anyone in cancer treatment in Canada. There is a US version of Victoria's Quilts as well. I normally don't like scarves, but France Luxe has some nice ones. Through their Good Wishes program, France Luxe sends free scarves to anyone in cancer treatment, US shipping included. Canadians are asked to pay the postage. Cleaning for a Reason coordinates free house cleaning for breast cancer patients through participating house cleaning services across North America. There doesn't seem to be very much availability though - I've been trying all year with no success. Who doesn't need free soap? Bethesda Skincare has what they call "the melanie policy" - they will send a free bar of soap to anyone with cancer, all you have to do is email them. Athletes 4 Cancer runs one week water based active programs in Maui for the 18-40 set. The programs are mostly free (one has a fundraising component) except for travel to and from the program site. YACC has started a new series of active retreats for people between the ages of 18 and 39 who are 1 to 5 years out of cancer treatment. Their inaugural retreat is happening right now in Gros Morne. The retreat is free except for travel costs to and from the program site. YACC also has not so active retreats for the 18-39 set. Once again these are free except for travel costs to and from the retreat. First Descents is based in the US and offers active retreats for cancer peeps between 18 and 39. Rumour has it they've started a program for the 40+ set as well. The activities range from rock climbing to white water rafting to (my favourite) surfing. The retreats are (sing along kids) free except for travel costs, although they might be able to help with that too. Women Beyond Cancer isn't just limited to the premenopausals, but it is limited to the double-X variety of human -- specifically those who have or have had cancer. Their retreats involve kayaking, horseback riding, yoga, and/or just lounging and being fed in various parts of the US and Costa Rica. Most retreats are free except for travel costs. Many places offer senior and student discounts. It's worth it to ask if they will extend those discounts to people with cancer; they often will. Find more freebies for Americans in But Doctor, I Hate Pink's List of Free Stuff. Update (Feb. 23, 2013): A Nerds World provides free family portrait services for families dealing with cancer.